After use, rinse sponge with tap water and squeeze until soap and dirt have been thoroughly washed out. Squeeze out all the excess water when done. Store in a well-ventilated area to dry. We bring you 6 types of Konjac sponges, developed to meet the diverse range of skins. The classic and original Konjac Sponge, made from 100% Japanese grown konjac. The fine plant fibers gently cleanse away dirt. It is recommended for individuals with sensitive skin. This Konjac sponge is mixed with Binchotan charcoal. Binchotan charcoal has numerous small pores that can absorbs chemical substances. The absorptive properties of the bincho-charcoal powder in the konjac sponge draws dirt and excess sebum out of pores, keeping your skin clean and fresh. 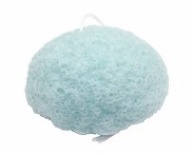 This Konjac sponge is has wild mint added. Wild mint has anti-inflammatory and disinfectant properties, which helps keep skin clean and improce texture.